What's Up With Pro Golfers Giving the Finger(s) on the Green? A few years back I was chatting with a teaching professional who was interested in writing a golf instructional book. Those books are a dime a dozen, I reminded him, and unless you have some kind of great hook for one, it's unlikely yet another instructional book will make any money. Oh, I have a hook, he said: green reading. Green reading? Yes, the teaching pro replied: think about it - green reading is one of the most important facets of golf, yet it's never really taught. New golfers are just expected to pick it up as they go. Oh, they might hear very broad advice about methods of visualizing break, but nothing really specific, nothing really in-depth. I did think about it. And I had to admit, that was a good hook. That's Lydia Ko and Adam Scott "giving the finger" to the break, using the AimPoint Express green reading system. Some background on AimPoint: It originated about half a decade ago when a fella named Mark Sweeney invented a software program that read the break on putting greens and then showed you the proper putting path - the path the ball would follow to the hole if the golfer hit it at the proper speed. AimPoint first came to prominence on Golf Channel broadcasts when the network started using it to show viewers the break any given golfer was facing on a putt. 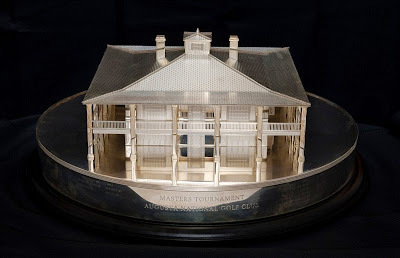 It was certainly very whiz-bang in the those early days when AimPoint's projected putting line was shown on screen overlaid on a green, and then a golfer's putt perfectly tracked that line right into the hole. But Sweeney soon realized something: The insights about putting and break and reading greens that went into AimPoint could also turn the system into a great tool to teach green reading. 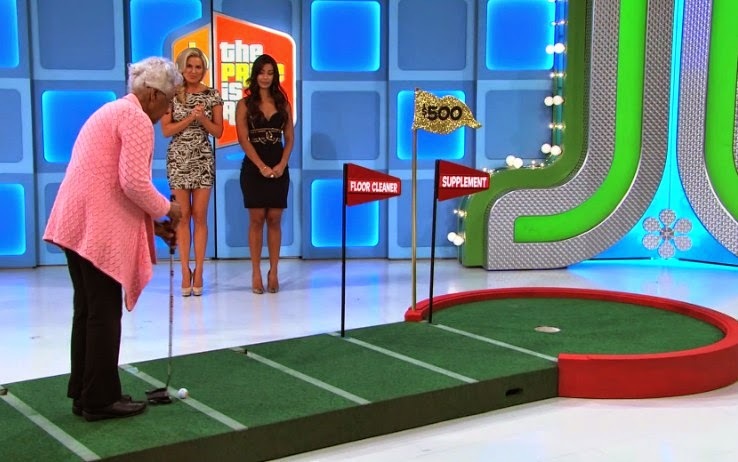 Once you have a number, pick out the line you want to start your putt on, assuming you'll be able to put the proper pace on the putter (proper speed is the speed that will send your ball 1.5 feet past the cup if you miss). Then hold up a finger or fingers in front of you - the number of fingers corresponding to the number from 0 to 7 that represents the amount of slope. When Adam Scott holds up one finger, it's because he feels a slope of 1 degree; when Lydia Ko holds up three fingers, she has rated the slope of the green a 3. What Sweeney discovered - happy coincidence - is that the width of our fingers corresponds very closely to the line you'll have to putt to accommodate the break for the slope you've felt. That is, when Scott holds up one finger, he is going to start his putt on a line that appears to him one finger's width off the flagstick. And that's the basics of AimPoint Express. Obviously that bare bones description isn't enough for you to run out and start making great reads all the time. But that's the gist of the Express version of AimPoint, and that's why you see so many pro golfers now holding up fingers on the green. Well, that's something you don't see every day - especially on an iron shot. 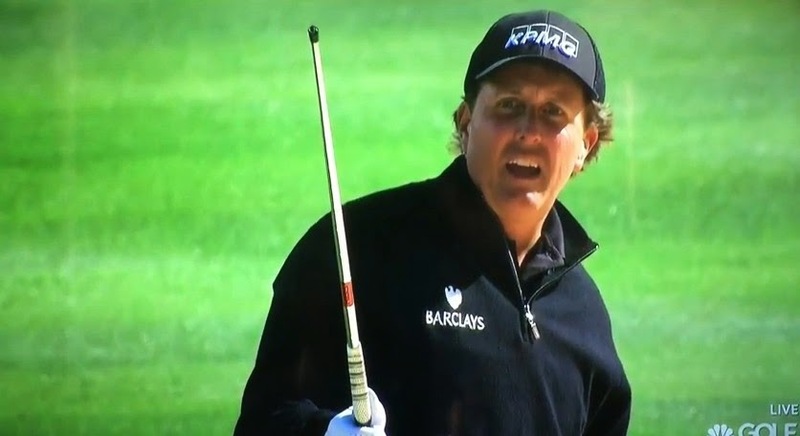 The head of Phil Mickelson's club just flew right off. 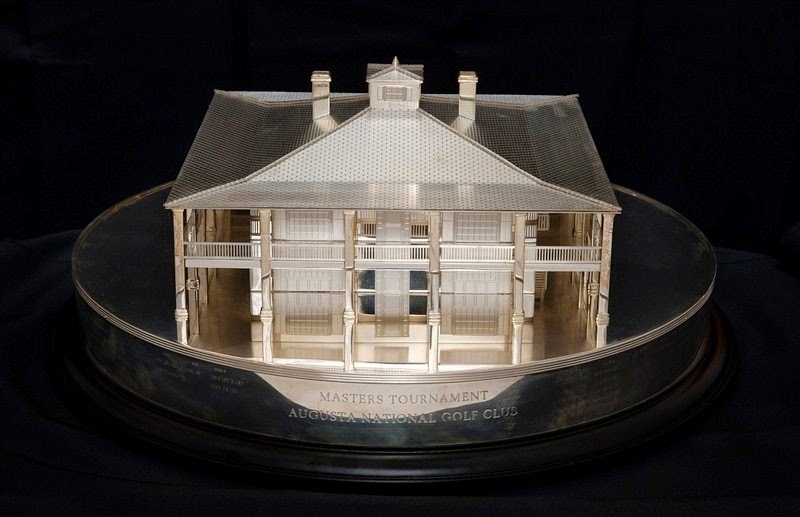 Mickelson was playing a sand shot during the first round of the 2015 Texas Open. His club didn't even hit a bunker lip or anything. It struck the sand and the ball - and the clubhead - went flying. That look on Phil's face! 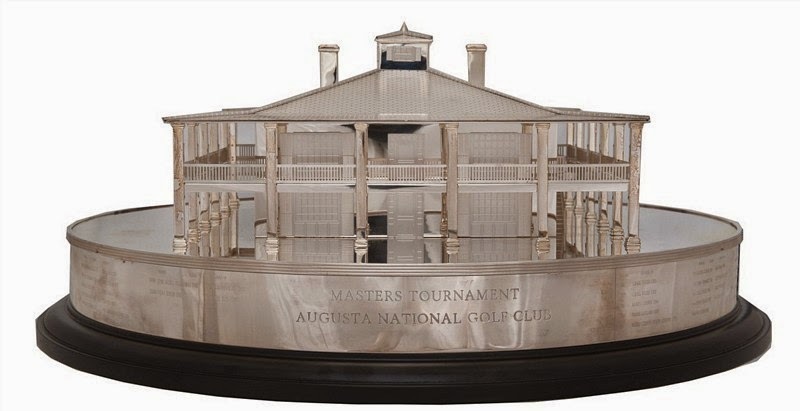 Apparently Golf Channel also picked up some audio, aired later, of Mickelson muttering, "What the heck?" I feel your pain, Phil. Been there, done that. Except it happened to me with a driver. Brand new driver, too, about 20 years ago. I teed off on a par-5 I was hoping to reach in two; instead, my club broke in two. It snapped at the hosel and the clubhead went flying about 75 yards forward - right into a water hazard. Not a good feeling. Golf and wildlife sometimes mix, and over the years we've seen birds carry off golf balls, as well as visits to (or at least near) the putting green by dogs, cats, alligators, snakes ... even bears. 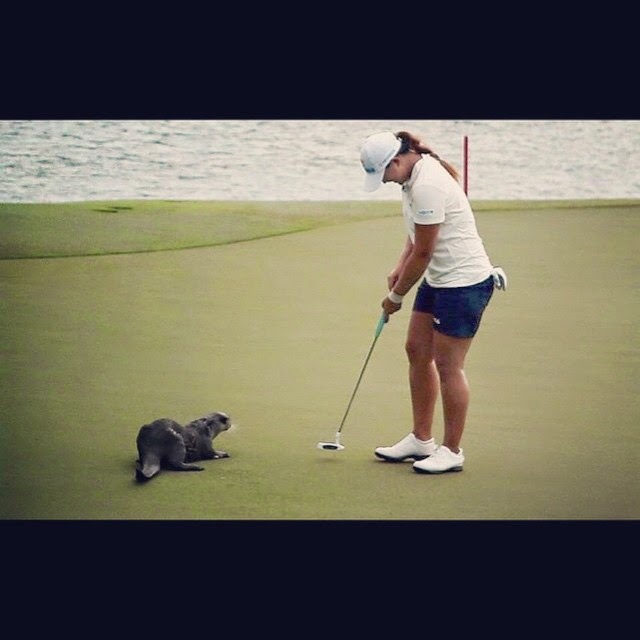 But we've never seen an otter on the green. Until today. Lee, in charming broken English, wrote, "I saw the otter on golf course :) his so cute. I love it." Wild otters have started breeding in the heart of the city, the first- ever known here to have done so. Now, experts are worrying about how to best protect them. Some researchers had considered Singapore's southern coast around Gardens by the Bay too built-up for these threatened native marine mammals that are often found at sea but need a source of fresh water nearby. But a pair of smooth-coated otters, which first caused a stir in February with their visits to the downtown park, have now raised five pups. Videos posted on social media over the last month show the family roaming and eating fish along the banks of Marina Reservoir. They have also been seen inside the Gardens and in its lakes. ... Others have also been spotted at East Coast Park and as far inland as Bishan-Ang Mo Kio Park. Today's YouTube find is this phony infomercial that dates to 2004. The fella in the video purports to be an expert at Urban Golf, and wants to sell you a set of videos telling you everything you need to know about Urban Golf. Do not call the number, the product doesn't actually exist! My thought upon first watching this was: Wow, this is bad. My second thought was: This is intentionally bad. It's a parody, after all. 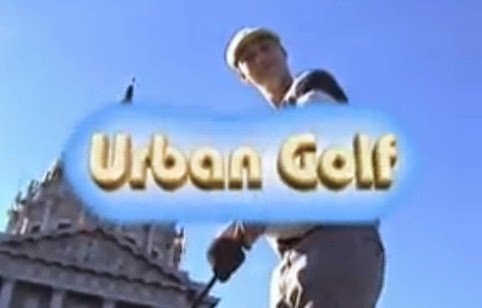 It's a parody of golf infomercials, but it's also a parody of Urban Golf and the too-cool-for-school people who do it, believing themselves to be "expressing themselves creatively" or something. Your mileage may vary, of course, as with all thing humorous (or trying to be humorous). Even if you don't think it's intentionally bad, you'll at least think it's bad, which presents its own kind of comedy. Did You Know Ernie Els Is a Restaurateur? Pro golfers owning restaurants is nothing new (we've written before about Graeme McDowell's restaurant, for example). But here's one we didn't know about until recently: Ernie Els owns a nascent chain of restaurants called the Big Easy Winebar & Grill. The first Big Easy restaurant opened in the South African university town of Stellenbosch inside an 18th-century Cape Dutch building. A second restaurant is now open in Dubai, inside The Els Club Dubai. A third Els restaurant, once again called The Big Easy, is being planned for Malaysia. Just like the man himself, Els' restaurants are found around the world. What does Ernie Els serve at The Big Easy Winebar & Grill? 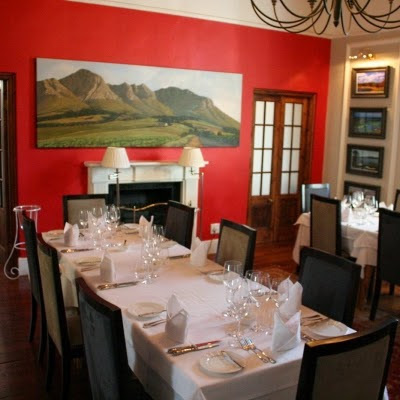 "The Big Easy places the utmost importance on serving great food and fantastic wine – all in a relaxed setting. ... dining at The Big Easy showcases the best the region offers with an emphasis is on using the finest, freshest ingredients to produce world-class food." The menu starts with salads, including a "Rocket & Parmesan Salad." What's rocket? That's what South Africans call arugula. Appetizers include venison carpaccio, Cajun fishcakes, plus prawns, mussels and oysters. Along with The Big Easy Burger, entrees include selections of venison, ostrich, salmon, chicken, prawns, calamari, lamb, linefish and crayfish. The wine list is extensive, as one would expect in a restaurant owned by a golfer who has his own wine label. The wine list includes Ernie Els and Big Easy wine labels, along with many other choices. The Dubai location has a menu that includes a few of the same things, but also many different things such as escargot, chicken liver, foie gras, pear and pork chorizo, oxtail risotto and chicken curry. On the side you can order the "Mother of Baked Potato," which is topped with duck confit, crisp pork bacon and Taleggio cheese.